It was 1989, just nine years into a new career pursuit, that of an artist and sculptor, I was commissioned to create my first monumental size sculpture. It was to be a thirty foot tall bronze and granite sculpture for The ProRodeo Hall of Fame and Museum of the American Cowboy in Colorado Springs, Colorado. It was to be an action portrait of Rodeo Legend, Casey Tibbs on a famous bronc named Necktie, an enlargement of a small bronze I did for Casey in 1985. I also found out that Casey was battling terminal cancer. The project was completed from maquette to monument in the miracle time of 140 days. Casey got to enjoy the unveiling and dedication, he passed away a few months later. At the dedication, Casey’s first words to the huge crowd on hand was, “Thank you Edd Hayes for making me look good. Hell I was good!”. 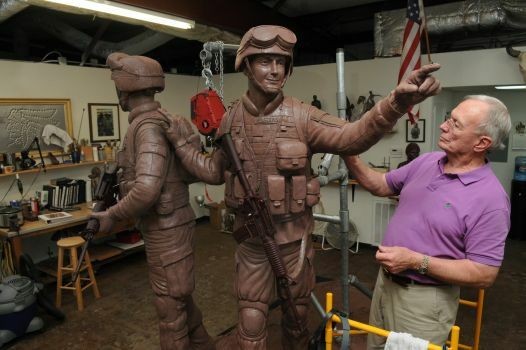 That whole experience led me to make a decision to devote the rest of my life and career as a sculptor to pursue and specialize in life-size and larger sculpture, monuments. Over the years, I have become extremely proficient in meeting, identifying and solving all the problems inherent in the designing, creating, transporting and installing of monumental size sculpture. So far we have designed, created and successfully delivered and installed over sixty life-size and larger bronze and stainless steel monuments, both public and private. Over the last couple of decades it has been my privilege to successfully work with some great folks, museum directors, and curators, university chancellors, community committees, city and state governments, corporations, fire departments, engineers, design and landscape architects, for a variety of public and private art projects in many parts of this great country in creating Monuments to America’s Heritage. Texas sculptor, Edd Hayes has received the honor of being named by The Texas Legislature as The Official Texas State Sculptor. The honor was bestowed, based on the scope of the artist’s total work along with attention to his portrayal of the history and rich heritage of Texas. Other factors include the artists’ involvement with community , civic and charitable organizations. Hayes is best known for his monumental sculpture such as “Wild and Free” at the Houston Astrodome and “The Champ” in front of The Pro Rodeo Hall of Fame in Colorado.